The Explorer 8 Development Board is a full-featured development board and platform for 8-bit PIC® microcontrollers. This board is a versatile development solution featuring several options for external sensors, off-board communication and human interface. Additionally, it offers ample room for expansion, making it an excellent solution for developers and engineers looking for a tool with the largest number of supported 8-bit PIC MCUs. With the Explorer 8 Development Board, you can have a single development platform that allows you to update a legacy design while supporting our newest MCU offerings. Microchip designed the Explorer 8 Development Board to be your main tool for 8-bit development with support for a wide variety of functions. On-board components enable easy development of human interface, power conversion, Internet of Things (IoT), battery charging and other applications using a powerful 8-bit PIC microcontroller. 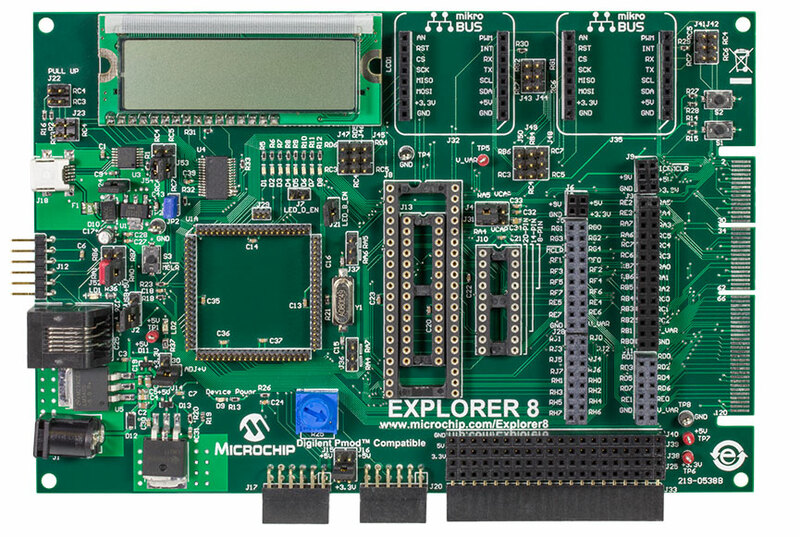 Additionally, the Explorer 8 Development Board also has a large capacity for expansion. Two Digilent Pmod™ interfaces, two MikroElectronika Click™ board sockets, and two custom expansion headers allow you to quickly adapt as your development needs change. The Explorer 8 Development Kit supports several programs and debug solutions including the PICkit™ 3, ICD 3 and MPLAB® REAL ICE™ In-Circuit Emulator. The Explorer 8 Development Board supports several options to easily add functionality to your design.